Even though I only got this watch recently, it is not a recent model. It is a so-called “NOS” – new, old stock. In many ways, this is a transitional model between the older Sturmanskie models and the newer ones. For example, the case size is for this model (40 x 11 mm) is probably a little small by today’s standards, in particular for a 24 hour watch. The luming, however, is every bit as good as the most recent Sturmanskie models. This model features a rotating bezel with 24 time zones, each identified by a city and a GMT reference. Frankly, while this does add a traveller’s orientation to the watch, it is almost useless as the names of the cities are written in truly tiny characters. On my model the rotation of the bezel is not too smooth either, but that may be due to the fact that it is an ‘old stock’. The date, however, is shown in a larger character and can be read rather easily. This watch has a nice and solid feel to it, it is well finished and the overall look of the watch is one of quality. 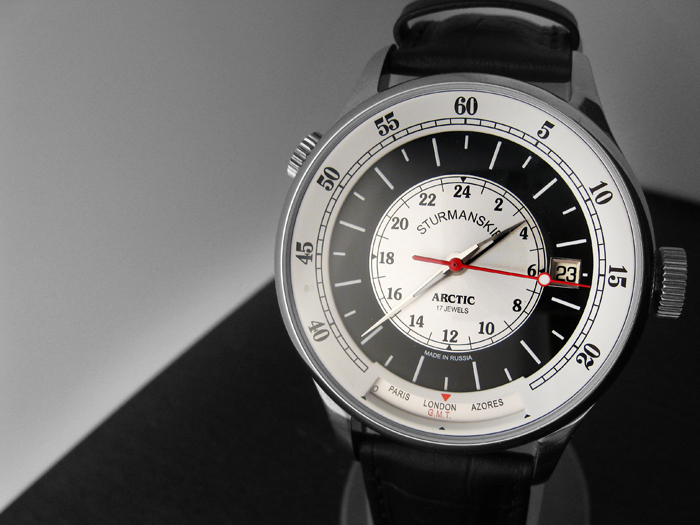 I wish Sturmanskie re-issued this model in a 45mm case and with a better, more readable, rotating bezel. This model is water-resistant to ‘3 ATM’ which really means that it is only minimally water resistant. Should Volmax ever decide to re-issue this series, I hope that they give it at least ‘5 ATM’ or even ’10 ATM’. A ‘world traveller’ watch should feature decent water resistance. No photograph will ever do justice to this remarkable model, arguably the most elegant and beautiful 24 hour analog watch ever created. While the Buran chronograph’s beauty is in its complexity, this Sturkamnskie’s beauty is in its elegant simplicity. The pearl white dial with rose gold (a Russian speciality) hours combined with the black bezel create a soft but very compelling contrast. The diamond shaped hour markers glitter with a soft rose gold reflection. Everything about this watch just radiates a gentle, yet compelling beauty and elegance which I have never seen in any other watch. The dial, however, is not easy to read, at least not for somebody new to 24 hour watches. The reason for this is that the hour indicators are small and since only every second hour marker is represented, this watch can look like a common 12 hour dial to a casual observer. Alas, this is a limited series watch, and only 250 of these were ever made. Unlike many Russians, I am not a big fan of commemorative watches. Frankly, I find most of them a little goofy, and the events that they commemorate are not always events I can relate to, or that I would care about. Most importantly, most commemorative watches are about the commemoration rather than about the watch. After all, if a watch is beautifully made, what need is there to “add value” (so to speak) to it by including a commemorative theme? Still, this one is the exception to the rule. First, because it is an absolutely beautiful watch. And second, but only second, because it commemorate mankind’s first step into space: the launch of the first satellite Sputnik. 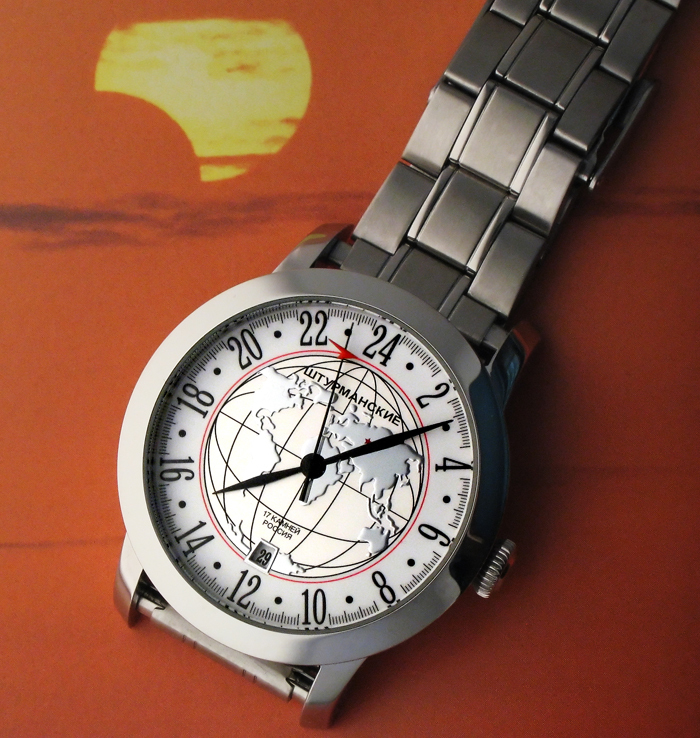 Sturmanskie actually released an entire series of “Sputnik” models (others are covered elsewhere on this website), but this is the only which explicitly displays commemorative features: a globe is featured on the center of the dial, and the seconds hand has a small red arrow, a stylized Sputnik, circumnavigating the earth once each minute. The effect is very nice, but it does not distract too much, giving the watch a very nice – and original – balance as a commemorative and timekeeping object. 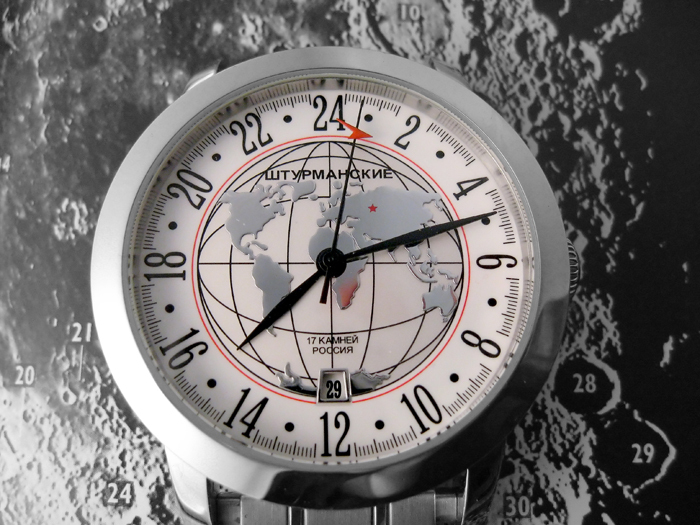 Since the first watch in space was a Sturmanskie, it is only fitting for company like Sturmanskie to make a watch with a space-theme. 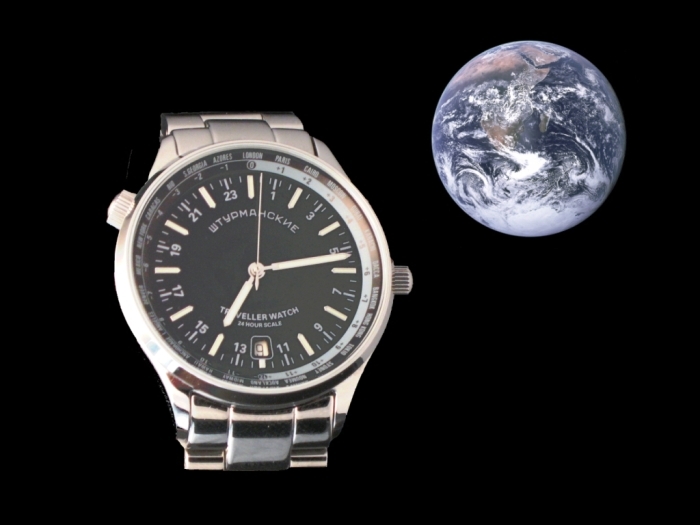 After all, Russian watches were the first in space and they are an integral part of the Russian space ethos. Sadly, this model has no luminous features at all, and the date is displayed in a very small window. So while this is a most beautiful watch, is is not the most utilitarian one. 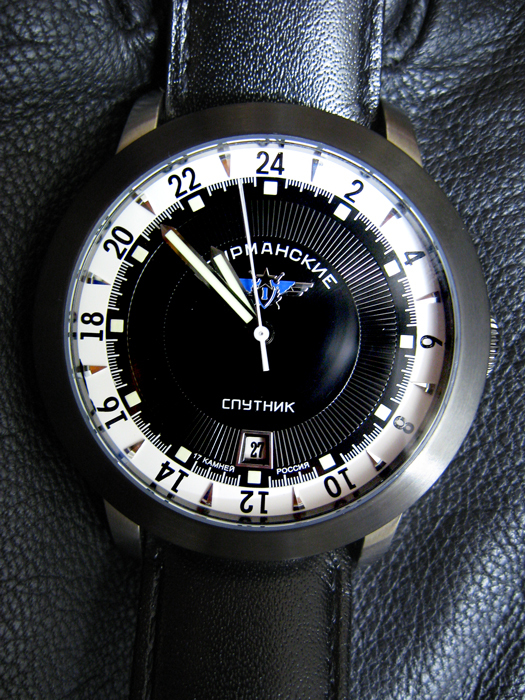 Another Russian 24 hour watch with a “polar” theme, but make no mistake: this is not a cheap and rugged Raketa. This is a beautifully designed and superbly crafted timepiece, possibly one of the most elegant one ever created in Russia. While this watch is not really expensive at all (about 220 dollars), it has a luxurious feel to it which unmistakably spells “high end”. 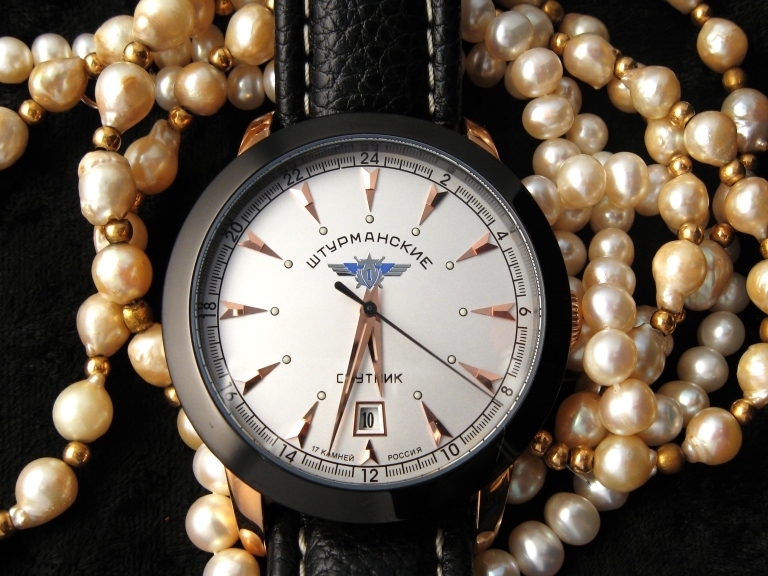 At a time when Western watch designers try to convince the world that good taste means spending thousands of dollars, the designers at Volmax (the company which makes the Sturmanskie brand) show that elegance is a mindset, not a price tag. There are several variations to this Arctic design, but I believe that this one is the most refined and beautiful one. As with all Sturmanskie, all the parts of this watch are made with great care and from high quality materials (including the thin, but very bright, super luminova coated hands). This watch would be best worn for a formal occasion, or in the evening.